Fritjof Capra, as I am sure pretty much all of you will know, is the author of many best selling books such as The Tao of Physics, The Turning Point, The Hidden Connections and The Web of Life, and more recently he has published two books on the life and scientific works of Leonardo da Vinci. His most recent book is The Systems View of Life: A Unifying Vision co-written with his friend Pier Luigi Luisi, and since I reviewed the book last year I wanted to share some of the conversations we had with Fritjof regarding this new systemic concept of life, and particularly what it means for leadership in organisations. It should be immediately noted that this is a simplified list and of course it is possible to go much deeper into these four characteristics, such as including the notion of metabolism and really understanding what is meant by cognition, all questions which are explored in depth in the book. When discussing organisational change, Fritjof sees that by and large the record of change management is poor. One of the main obstacles is the largely unconsciousness embrace of the metaphor of the machine. When implementing change management programmes, designs from outside are imposed through a mindset of top-down control, using machine-like language such as ‘re-engineering’. However, we need to realise that machines do not change by themselves (they are not living). If we take the systems view of life we see that human organisations have a dual nature. So in asking Fritjof if an organisation is a living system his answer is both yes and no. Organisations can be said to be alive in that they are communities of people with meaningful work. But organisations also have a non-living aspect in that they are business entities with formal structures. The dual nature means that you need two types of change. You need to look at how an imposed design interacts with the living elements. In Fritjof’s words “People do not resist change but they do resist having change imposed on them”. Natural change processes are different to re-engineered change. So therefore we need to understand natural change processes. So in what way are human organisations alive? Fritjof answers this question by saying that a human organisation is only alive when it contains networks of communication. These informal networks of communication he refers to as communities of practice and in larger organisations there are clusters of communities of practice. Therefore for Fritjof “the aliveness of an organisation resides in its communities of practice, flexibility, creativity and learning potential”. We can now see an organisation as having formal structures which have sets of rules which establish boundaries, and informal structures which are fluid and flowing networks of communication. There is continual interplay between formal structures and informal networks. So if we take the systems view of life as our guiding principle for leadership, what lessons can managers and leaders learn? Over the last few weeks or so I have noticed a number of people raising the issue that in the Agile community, some dissident voices are beginning to raise objections to the imposition of Agile techniques which are imposed top-down in the search for ever-increasing margin, cost reductions and operational efficiencies. This is the old command-and-control mindset attempting to integrate a way of working which operates from a different paradigm, and only those Agile coaches and practitioners who recognise the human element, and that organisations do have informal networks of meaningful communication will be successful. As just one example of what I am talking about, Daniel Mezick has recently shared some tweets from Agile coaches regarding “imposed Agile” or “mandatory Agile practices” which you can read here: Problem? What Problem? One great example I feel comes from Henrik Kniberg, author of the book Lean from the Trenches: Managing Large-Scale Projects with Kanban. Kniberg is an agile coach who has spent much time working in the Spotify engineering culture. 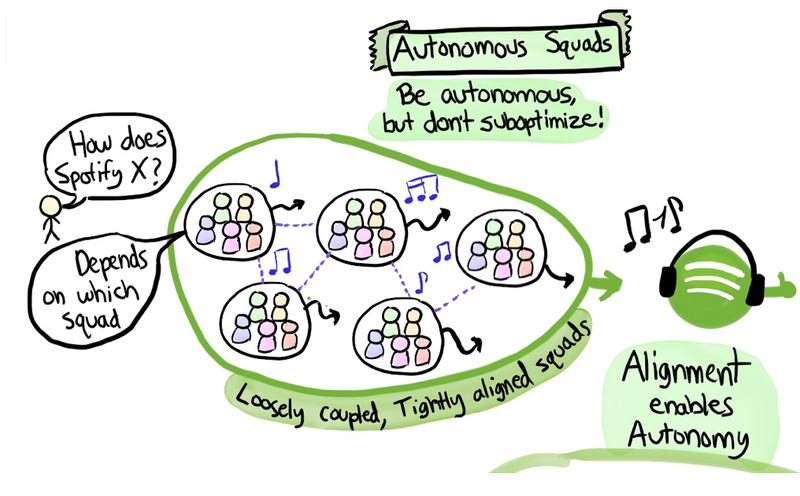 An autonomous squad is a small, cross-functional self-organising team, usually less than eight people in size. They sit together, and have end-to-end responsibility for the code they build. Autonomy means responsibility for what to build, how to build it, and how to work together while doing it. The boundaries are the squad mission, product strategy, and short term goals negotiated every quarter. Kniberg points out that the most valuable communication happens in informal and unpredictable ways. 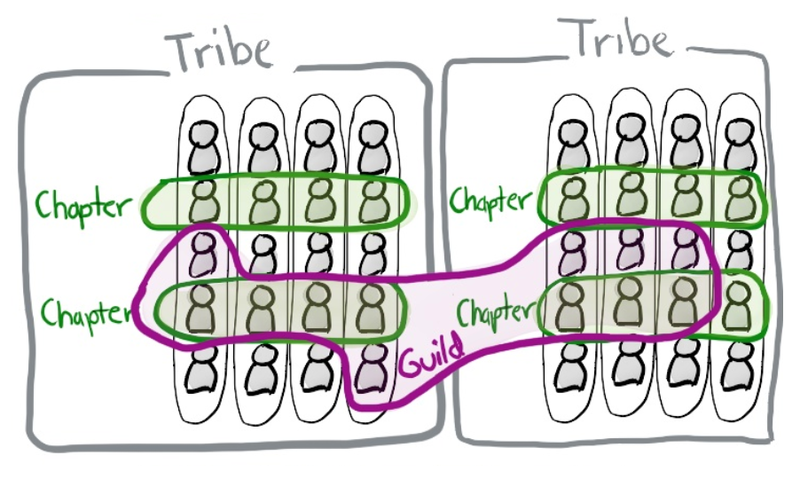 To support this Spotify also have tribes, chapters and guilds which are a “lightweight community of interest” where people across the whole company gather and share knowledge, such as leadership, web development or agile coaching. At Spotify, the main focus is on community rather than hierarchical structure. In a recent post I wrote about the importance of both community and human values. It is therefore interesting that Kniberg makes the observation that a strong enough community can get away with an informal volatile structure”. Spotify, I would therefore suggest, could be said to be much more alive than many other more hierarchical and power-based organisations and businesses. Fritjof describes the shift into the systems view of life as being as “radical as the Copernican revolution”. I would wholeheartedly concur with this, and spending time with Fritjof these last couple of weeks was inspirational for me, really being able to explore in depth the remarkable achievement of Fritjof’s work, which is not a mere summary of his previously published works, but which for the first time offers a radical new conception which shifts our thinking into relationships, patterns and context. When asked what is stopping people from really integrating systems thinking into their lives, be it social, economic or political, Fritjof replies that the answer lies in human values. The introduction of universal human values into organisations does of course also lie at the heart of our own book Holonomics: Business Where People and Planet Matter, and therefore transformation has two dimensions – systemic thinking and ethical practice. So whether we are business leaders or Agile coaches, when we adopt the systems view of life we really have to live our values, and then we will discover that our organisations will shift from being dead to alive, and thriving in a world where people and planet matter. Capra has done it again. Exceptionally insightful book, well worth study! Excellent review of a thought-provoking book.